Don't let anyone tell you that fall is only for watching football and carving pumpkins- oh no, no, no. 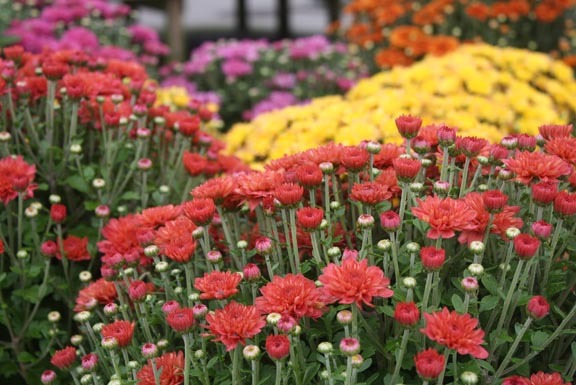 Fall is a fantastic time to spend in your garden. The days are cool and the sun's rays feel great against the crisp fall air. Fall is also a good time for assessing what worked and what didn't in your garden and for making new garden beds for spring planting. Where to begin in your garden. Start by cutting back anything that may have already passed in your garden or has begun to die back. This year's fall garden is not as steller as normal thanks to a little hurricane called Irene. I find I am cutting back things much earlier than normal. To me that's not a bad thing, it means more time can be spent planting bulbs, dividing overgrown perennials and planning new garden spaces. Dead Spots in the middle of your perennials. Dead spots are normal for some perennials like grasses and Siberian iris, and it's not a bad thing, it just means it is time to divide that plant. If you are like me, I have a love hate relationship with dividing plants. On one hand, I love cutting a plant up into two or more parts so I can spread them around my yard, but on the other hand I am running out of garden space and dividing a plant means creating another garden! Rule of thumb for dividing perennials are as follows: If it blooms in the spring, divide in the fall. If it blooms in the fall, divide in the spring. To divide perennials, dig up the parent plant using a spade or fork. Gently lift the plant out of the ground and remove any loose dirt around the roots. Separate the plant into smaller divisions by teasing the roots apart or cutting them with a sharp knife or spade. I always have a cheap serrated knife on hand for such an event. Plants may also be separated by placing two forks in the center of the clump back to back and pulling them apart. Keep these divisions shaded and moist until they are replanted. Lavender plants should be pruned but not cut back hard in the fall. Make sure there are green leaves to be seen when cutting back. L. stoechas, L. angustifolia and L. x intermedia may be pruned back by 1/3 to ½. This helps to keep bushes young and healthy. If cut any lower, the stems will die. 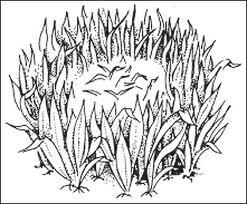 Lavenders that have not been kept well-pruned have a tendency to become woody in the center of the bush. Late Septmeber into October is the best time to plant garlic. Just before planting, take bulbs apart. Do not peel them. Place them pointy side up about two inches deep. Water well, and place a nice layer of mulch on top. Grass clippings work well. You will harvest your garlic the next summer, mid to late July or early August. Wait until the tops have turned yellow and started to fall over before harvesting. 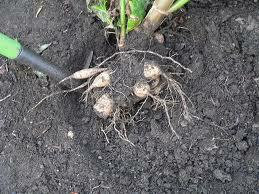 Tubers should be dug prior to a hard freeze or you may lose them. Some people have been known to mulch their dahlia beds with six inches of straw and then covered with a large plastic pot held in place by plant stakes through the drainage holes to protect against freezing. If you raise a lot of Dahlias this may be easier than trying to dig and store all the tubers. Place the fork approximately one foot from the stem stub and insert it deep into the soil--at least eight inches. Pry back on the fork to loosen the soil. Repeat this action around the stem and root. Prying back on the fork should lift the tuber and the clump of dirt. Taking hold of the plant, gently lift while prying back on the fork until the clump comes free. 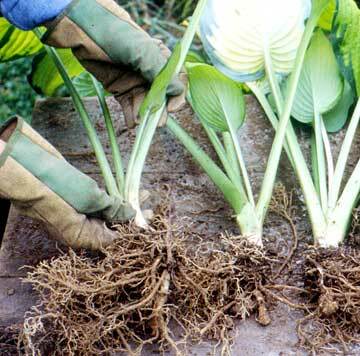 Lift the clump and remove the soil from the tuber. This must be done gently. Many tubers have rather small necks and can be broken or cracked easliy. A tuber with a cracked or broken neck will not grow. Gently brush off excess soil and rinse clean with a garden hose. Do not wash the skin off the tubers. Air dry the clumps at room temperature for a day or so. Do not wait so long that they turn hard. Label the clumps so you know which is which. Use a tie-on label for each clump, or write the name on the tubers with a permanent marker. Tubers should be kept in the dark at a steady, cool temperature so they stay firm without rotting, shriveling or sprouting prematurely. The storage place should be dry and safely above freezing but below 50 degrees. Aim for 40 to 45 degrees. Consider an unheated basement, attic, crawl space, attached garage or even a refrigerator. Tubers may be packed in a plastic bag with holes punched in it, or in a loosely closed plastic bag, or in a closed cardboard box or paper bag. Surround the tubers with peat moss, dry shavings, coarse sand or newspaper to both insulate and separate them. The tubers should not touch each other. They must be kept dark. FYI: The Garden Guru is interested in answering your garden questions. Please email liz@bartlettsfarm.com with any plant related questions you may have. Q. I have a turkey fig tree planted outside. It is a zone 6 plant, should I protect it for the winter? A. Altough your fig tree is a zone 6 plant, I suggest protecting it from the harsh winter winds we receive on-island. 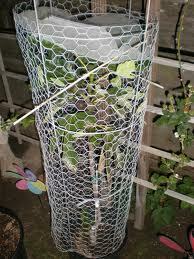 Enclose your fig tree with a circle of chicken wire supprted by tree stake. Fill the chicken wire with straw- not leaves. For even more protection wrap the chicken wire with burlap. Remove the wrapping in spring before the Fig tree will leaf out.